A slightly modified version of Xotic BB Preamp from Mesa Boogie. From layout Led+ a wire go to positive led.Negative led leg go to 3pdt footswitch. Verified! Tried 4558 in both positions and TL072 in bottom position. With both 4558s you get a faint hiss in the background but not with the TL072. Thanks Alex. Thanks also to Kenfoe for tracing his original pedal. Thanks for your props, Alex! Thank you for your nice layout, well done - very compact, I really like it! Hello, sorry if it´s a dumb question but, what are those transistors? 2N5089. It says so on the right side of the layout. I cannot find 19k resistors anywhere. So, can I use something else like a 20k or perhaps solder together an 18k and a 1k? Would this still work? Hi Mark, you can always put 2 resistors in parallel e.g. 47k+33k gives 19.38k, or 150k+22k gives 19.18k. 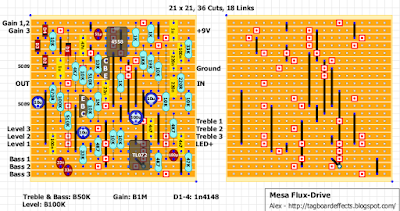 Is the bass and treble wiring correct in the layout, I can´t seem to get it to work.. The basspot works when I disconnect lug 1, the treble does´nt work at all, no effect there. When I wire the gain according to the layout the gain is reversed. can i substitute 2N5088 instead of 2N5089? Yes you may, 5089 have more gain. do you have the flux-five diagram? Hi,i have a question abaut capacitor C3 and C9 from the schematic. C3 is 51pF,and C9 is 151pF. On the layout C3 is 51,but the C9 is 180pF. is that making any diference ? This is mine first time,so please help.. and wich tipe of capacitors they are ? ceramic maybe ? 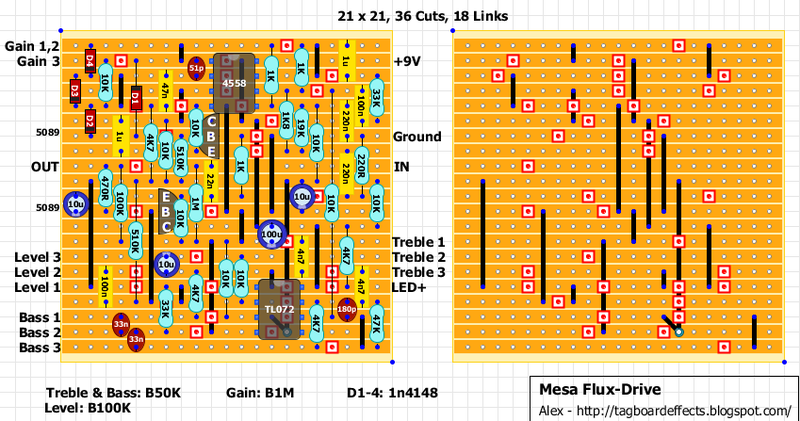 Great layout Alex, really neat!! If i may note something, there is a small mistake in it though: the wiper of the gain potentiometer shou!d be bridged with leg 3, ie. one cable goes to leg 1 and the other to pot 2 (and three). Everything else is working as expected, so one more verification! That doesn't make any functional difference at all and is not a mistake. Second. The resistance between lugs 1 and 2 is exactly the same wether the lug 3 is tied to lug 2 or not. I tend to omit those as well.